This jar fragment from the time of Kings David and Solomon is the earliest alphabetical written text ever discovered in Jerusalem. Unearthed near Jerusalem's Temple Mount by Hebrew University archaeologist Dr. Eilat Mazar, it is dated to the tenth century BCE and bears an inscription in the Canaanite language. The text contains a combination of letters approximately 2.5 cm tall, which from left to right translate to m, q, p, h, n, (possibly) l, and n. The archaeologists suspect the inscription could specify the jar's contents or the name of its owner. Credit: Photo courtesy of Dr. Eilat Mazar; photographed by Ouria Tadmor. The discovery will be announced in a paper by Dr. Mazar, Prof. Shmuel Ahituv of Ben-Gurion University of the Negev, and Dr. David Ben-Shlomo of the Hebrew University, following their extensive research on the artifact. Prof. Ahituv studied the inscription and Dr. Ben-Shlomo studied the composition of the ceramic materials. 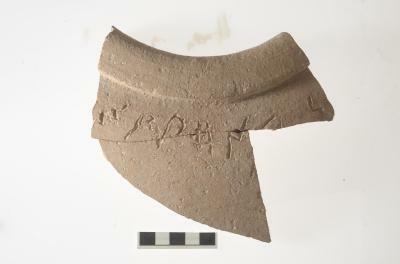 The paper, "An Inscribed Pithos From the Ophel," appears in theIsrael Exploration Journal 63/1 (2013).